Hi all. It's my turn today on the Craftwell blog. Hoping you're all getting in the mood for some fun holiday crafting. I chose a fun wood project for today featuring Dixie Belle Paint, our sponsor for the month. The Chalk paint is creamy and a delight to work with. Switch out colors. Stir the Dixie Belle Paint before adding to your siphon cup or bottle. 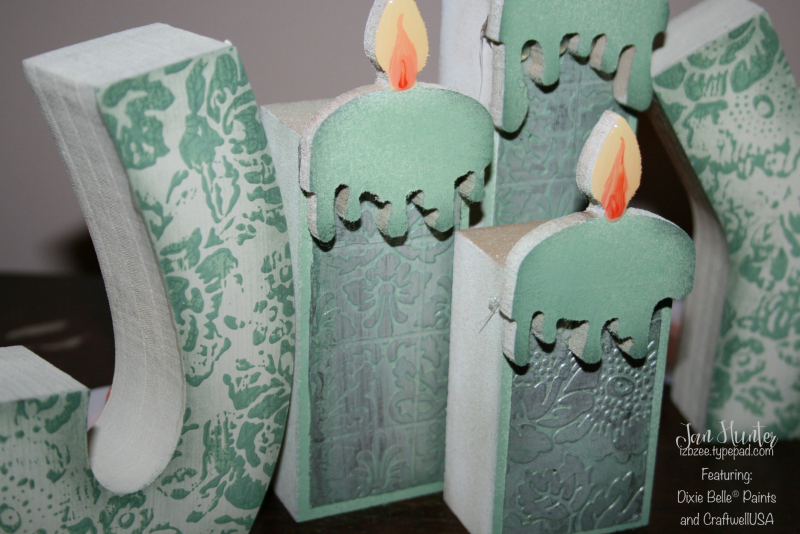 Dilute slightly -- less than a 1 -1 mixture (paint- (less water)) Spray the candle pieces as desired. I wanted just the edges of the candles to show color. The melted wax pieces were colored, leaving the flames still showing their base coat. Don't put the eBrush away yet!!!! Once the paint has dried on your wood, if desired, add a little more color along the edges. You can use the eBrush and the siphon and more Dixie Belle Paint. Sign your project! AND Don't forget to clean that embossing folder! I really like how it looks! Thanks for stopping by today and please, drop by next week for another fun holiday home decor project featuring Dixie Belle Paint and the eBrush! For more projects featuring the eBrush and Cut-n-Boss, visit my blog! Super cool.....Ebrush looks so fun to use! Gorgeous! Love the techniques you used!